Tired of pH ups and downs? Tired of dealing with pH pens? Then we’ve got good news: There is a new base nutrient formula that has a built in safety net, guardrails along the pH highway, that will perfectly maintain your pH without any work on your part. It will do this 24 hours a day, 7 days a week. That means no more pH ups or downs. Ever. And all you’ve got to do is pour it in. Sensi-Grow, for your vegetation phase, or Sensi-Bloom, for your bloom phase. It’s actually 5 different premium products in 1 bottle. Which means that when you buy this special new formula, you’ll save hundreds of dollars a month. 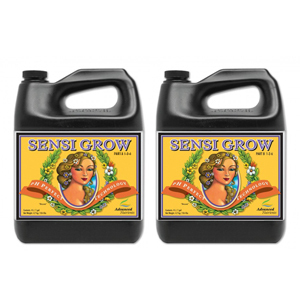 Sensi-Grow/Bloom A & B is a two-part base nutrient formula that is ridiculously easy to use. You just measure the two parts, according to the mixing instructions on the bottle, and voilà. You can get on with your life. And because Sensi-Grow/Bloom A&B includes pH Perfect technology, your pH will constantly be maintained at the perfect level for optimal growth. As long as you’re using pH perfect products, you don’t need to measure or alter anything to stay within the perfect pH range. Which means you can stop suffering with those dreadful pH pens altogether. pH Perfect is such a potent technology that it can bring a pH of 8.7 down to 5.5 in a matter of seconds. Or, it can raise a low pH of 4.8 to 5.5 in the same time. Wet Betty – our prized non-ionic surfactant. A surfactant eases the tension in liquids so that your plants can feed more freely. Think of this as way to remove friction. It’s the difference between an old train on a rusty track and a Japanese bullet train that uses electromagnets to hover, so it can sail through the air at hundreds of miles per hour. Thing is, most surfactants could easily be replaced with dish soap, because they’re not researched and developed for the specific type of plants you grow. Wet Betty, on the other hand, has been painstakingly researched and developed, through 1000s of hours of plant-specific tissue sample tests. And you get it free when you buy Sensi-Grow/Bloom A&B. Grandma Enggy’s H-2 (Humates) – both the humates and fulvates we use are sourced from Leonardite, a rare volcanic rock that is one of the most mineral rich substances on the planet. Humates will boost seed germinating and root growth, as well as boost the power of chelation (which we’ll explain in just a moment). Grandma Enggy’s F-1 (Fulvates) – fulvates increase the permeability of plant membranes. These will work hand in hand with Wet Betty to make sure your plants can feed effortlessly. Like our Humates, and all of our products, the fulvates we choose have been carefully tested and selected for the types of plants you grow. Sensi-Bloom/Grow A&B – Of course, there are the base nutes themselves. Not only do they perfectly balance your pH with pH Perfect technology, but they address every one of your plants’ 16 elemental needs. Going far above and beyond the call of duty, Sensi is much more than your average N-P-K (nitrogen, phosphorus, potassium). And each of the elements in Sensi-Grow/Bloom A&B is chelated to the highest quality standards currently possible. Note: Advanced Nutrients does not use paclobutrazol, daminozide, or any other banned plant growth regulators in our products.